An MP jailed for lying about a speeding offence has used a YouTube video to protest her innocence and vow to be a "voice of change in Parliament". Peterborough MP Fiona Onasanya, 35, was jailed for three months in January for perverting the course of justice. The independent MP, who was expelled from Labour, will face a by-election if 10% of her constituents - about 7,000 - sign a petition opening on Tuesday. 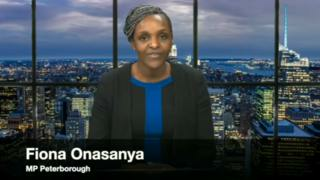 Ms Onasanya said she would continue to fight to clear her name. At an unsuccessful appeal against her conviction on 5 March, Ms Onasanya claimed that someone else was driving her car, which was clocked doing 41mph in a 30mph zone in Thorney, Cambridgeshire on 24 July 2017. But at the Royal Courts of Justice the MP, who was released on 26 February, was told there was "absolutely no basis" for challenging the conviction. Her brother Festus Onasanya was jailed for 10 months for his involvement, after pleading guilty to the same charge. Addressing her constituents in the video, she said: "I will continue to be your voice of change in Parliament for as long as you wish me to do so, and if you do wish me to do so." In the video, posted on her YouTube channel, she said: "Just like a coin has two sides, so does a story. "I have not perverted the course of justice. I have not colluded with my brother. "My defence was never put across in the media. At all times, they always put forward the prosecution's case. "Do you think, as your member of parliament, I would risk everything, and I mean everything, for the sake of points and a fine?" Ms Onasanya, who was elected in the 2017 general election, did not expand on her version of events. But giving evidence during her trial she said she was not at the wheel of the Nissan Micra and allowed family to borrow the vehicle while she was working at Westminster. She said she had spoken 95 times at the House of Commons in her first 500 days in office, as well as looking at "1,669 individual cases". The recall petition opens at 07:00 GMT on Tuesday and closes six weeks later at 17:00 BST on 1 May, but can only be signed by eligible Peterborough constituents.